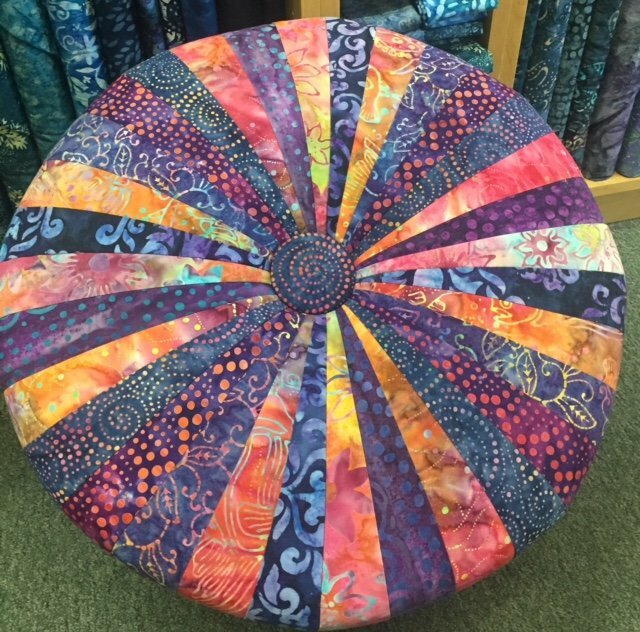 In two (3 hour) sessions you will create your own unique Tuffet! In Session 1 you will be sewing and learn the technique to make the foundation pieced Tuffet cover. As homework you will finish the Tuffet cover before Session 2 when we will put it all together. Tuffets can be whimsical, elegant, scrappy, or made to match any room. Every little girl needs a Tuffet, even grown up ones! Robin, the instructor, will supply finishing kits the tools needed to finish the Tuffet. PATTERN required:Tuffet Source Pattern (fusible interfacing included). Available from quilt shop. FINISHING KIT: ($125) includes pre-drilled wood base, 18” round upholstery foam (with a 50lb ILD), Dacron upholstery batting, t-nuts, cording and button, 4 Bun feet – with 5/16” -18 hanger bolt already installed. SUPPLIES: Please review supply list carefully. Supplies are denoted by “bullets”. See Supply List available at www.westcoasttuffets.com for supplies and pre-workshop homework. If you have questions you can contact Robin via the website or contact her directly at robin@kenzos.com or call her at 408-741-1766. FUSE: Follow pattern instructions to fuse interfacing to muslin (top of page 2). Cut apart the 8 units and stack. PRECUT: 32 (3"x21") fabric strips and arrange in your design order. For instance if you are doing a rainbow design pattern, cut 8 red, 8 orange, etc. Lay out the stacks of color in the order you want to sew – a stack of 8 reds, a stack of 8 orange, etc. It can be helpful to number them or snap a photo.